As of the close of trading on February 28th, US stocks were well recovered from the 11% correction of just three weeks ago. The S&P 500 is down 2.4% for the month, but remains up 3.2% on the year. In other words, if you just got back from a 2 month safari and checked your stock account, you’d presume that stocks were having a typical drama-free year. 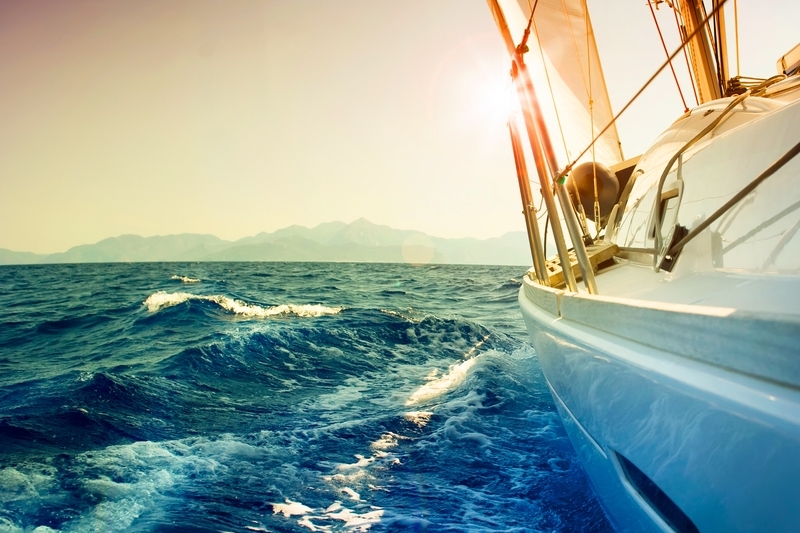 There’s a reason why experienced investors are often also sailors. In either endeavor, you have your skills, experience and plan, but when bad things happen, you just have to deal with the situation! An example of this comes from my own recent personal experience. Earlier this month my girlfriend Randy and I went on a long-planned vacation. We chartered a racing yacht for a week’s sailing among the islands of Martinique, St. Lucia and St. Vincent in the French West Indies. When we arrived, we learned that unusual weather patterns created winds twice as strong as we expected (we expected 15-20 MPH, but what we got was 25-40 MPH!) At our local sailing club, we usually cancel racing when winds exceed 25 MPH. We went out the first day with the owner of the yacht for a checkout cruise. We realized that we could sail the boat for the next 7 days by ourselves, but in this weather, we would manage to do so only in “survival mode,” taking the enjoyment out of the experience and potentially placing us in danger. We quickly recalibrated, asked the owner to find us an extra crew member, and spent the rest of the trip sailing with local expert sailor Fred. With three people on board, we could rotate positions so that no one got fatigued, and one person could drive while the other two could chat about sail trim or the course, or simply go below to make lunch. Our last day back was a passage from St. Lucia back to Martinique, a distance of 30 miles. The weather forecast was for wind speeds between 30-40 MPH and waves of 8-12 feet. We determined our float plan the night before. In the morning we set our sails conservatively for the expected high wind conditions. About an hour before we arrived at our destination, we noted a rain squall heading in our direction. A squall is a sudden, sharp increase in wind speed usually associated with active weather such as rain showers, thunderstorms, or heavy snow. Indeed, when the squall caught up with our boat, the top gust we saw exceeded 60 MPH, and the wind speed stayed over 50 MPH for 20 minutes. The crew trims the sails to achieve full power, which drives the boat forward, without creating “over power,” which increases the heel (angle of lean) of the boat uncomfortably. Some heel is normal and necessary for good sailing. With too much heel, the boat won’t sail efficiently and just drags sideways. By turning upwind, I could take the main sail “off the wind” (fluttering in the breeze and not powering the boat) and drive on the power of only the jib. We were still sailing at 12 MPH, which is twice as fast a recreational boat, but the boat sailed comfortably with well balanced heel. I looked forward with extra alertness because I could only see ahead 100 yards in the driving rain and spray, and I did not want to collide with another boat. I also checked our position on the chart plotter to make sure we weren’t near any reefs or shallow water. When the squall passed, we resumed sailing as before. Here is the analogy to investing: the stock market correction of the last two weeks was very much like that squall – understandably very worrisome to investors with little experience in such conditions, but “situation normal” for investors who have been through a few storms. In January, our portfolio manager Lucas Doe and I discussed how the market was long overdue to for a correction, but we continued rebalancing our portfolios as usual. During the correction we suspended trading for two weeks (essentially “feathering” our clients’ portfolios). Now that the market has calmed down, we have resumed regular trading activities.